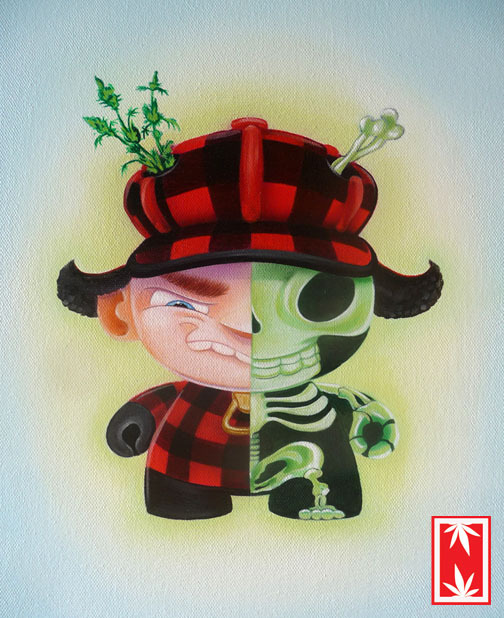 These two NUGGS pantings by Ian Ziobrowski are hanging in Kidrobot's NY store and are for sale there. Each measures 11 x 14" and they are a combo of oil and acrylic on canvas. 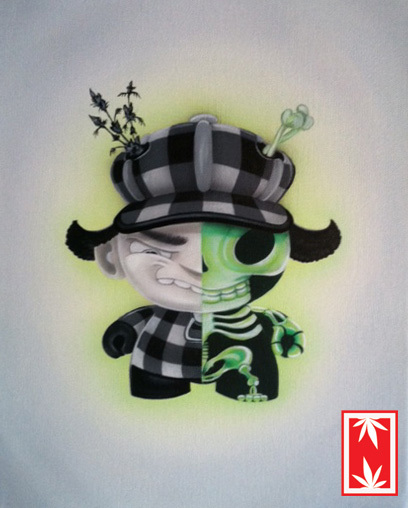 These paintings are based on a commission that Ian got, and the black and white version above will be a custom 8" Dunny. You can find Ian on Facebook if you're looking to contact him about paintings or commissions. Click here for an idea of what toys and products will be available for sale at our booth! 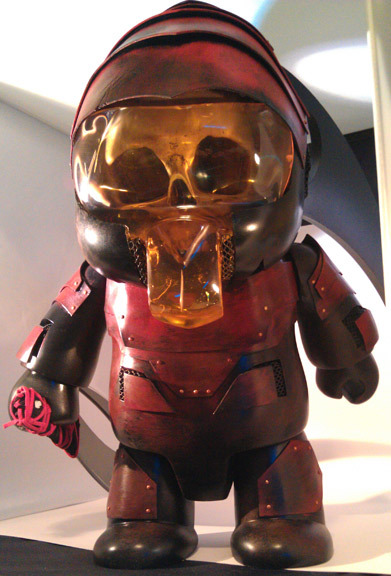 Behold: The Reaver, a new, as yet unseen, custom 16" Toy2R Qee by Matt Anderson! Will be for sale at NYCC Booth 876, where we'll be hosting this biggest, baddest custom show you've ever seen at a comic-con. The Reaver is priced at $2,500, and it's one-of-a-kind. I was just talking to Kevin Winnik (President of Toy2RUSA) today and he asked me if we were going to be able to fit the customs we're bringing into the booth. 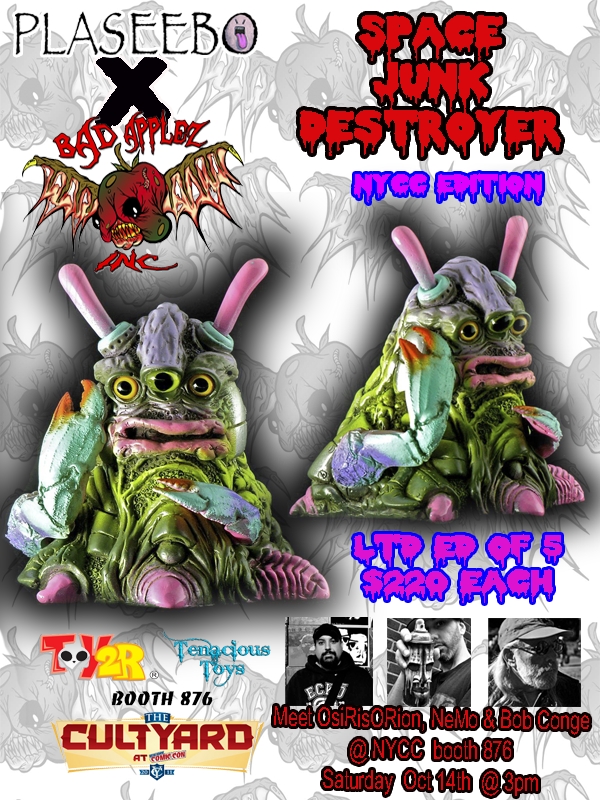 Somewhere, among a few hundred Toy2R production toys by JPK, Jason Freeny, Emilio Garcia, we're going to have about 75 custom Qees crammed into every corner of the booth. 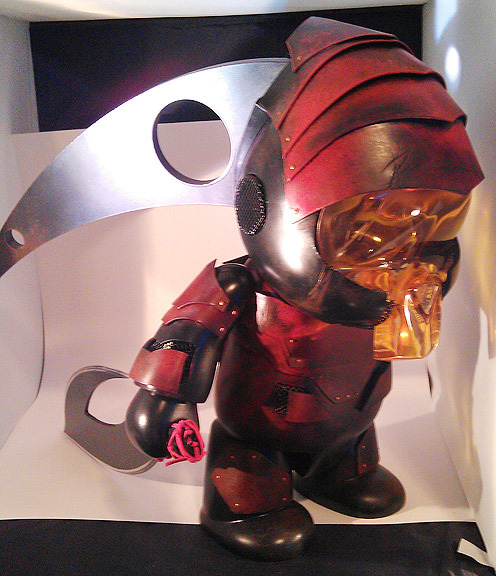 Not to mention resin toys, and even custom Qees incorporating cast resin pieces! Madness. Expect many, many more posts here about the insane customs as we run up to NYCC. Booth 876. 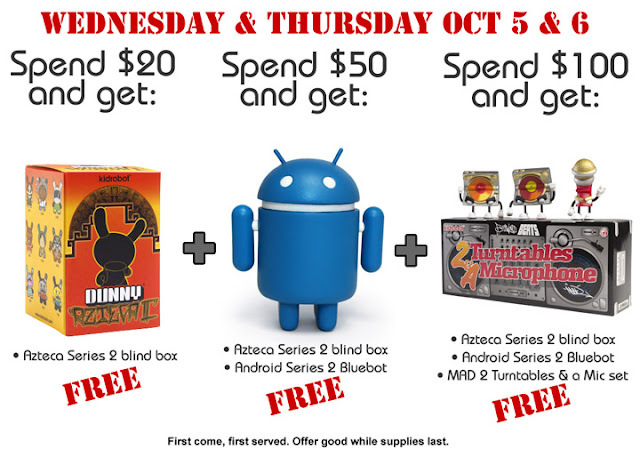 Oct 5 & 6 Promo: FREE TOYS WITH YOUR PURCHASE! • Make a $100+ order and get an Azteca S2 BB Dunny, an Android Bluebot and a Kidrobot x MAD 2 Turntables and a Microphone boxed set, all FREE! 2 days only. Offer good while supplies last. In the unlikely event that we run out of one of the free items, we will work with you directly to come up with a comparable alternative. Click through to our website to go shopping! Space Junk Destroyer is limited to 5 pcs. and will be priced at $220 each! Bob has really knocked this out of the park! He sculpted custom claws for the figure and has added his signature paint sprays and glass eyes! Come meet all 3 of us at NYCC! We will be at Toy2R & Tenacious Toys booth ( #876) on Saturday October 15th at 3pm est! The NYCC edition of Space Junk Destroyer will be available for sale at that time! BUTTY Introduction Commercial from Mister Harmstrong on Vimeo. Mister Harmstrong's Pantelis Nikolaides creates a brand new character! His name is BUTTY, and he's ready to find the way into your hearts and vinyl toy collection.